Ask Charles Cherney - Question #19 - What is the Mass. 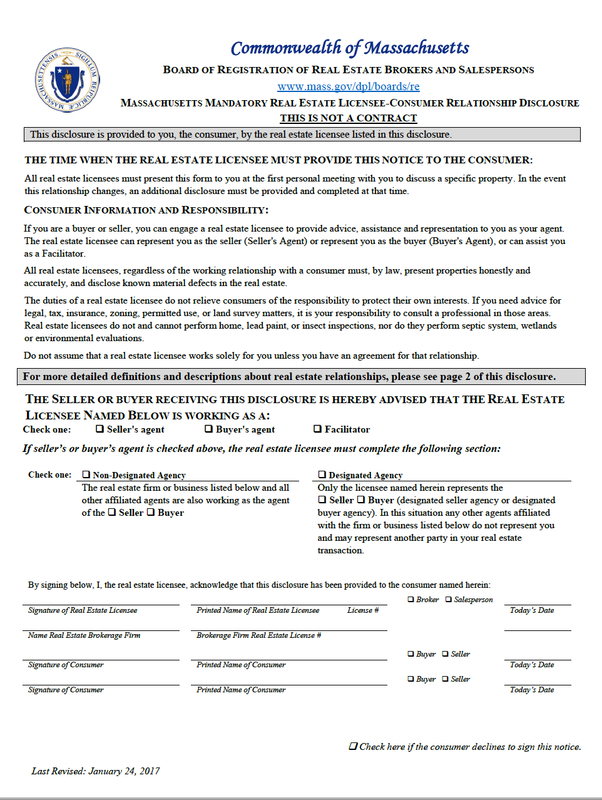 Mandatory Real Estate Licensee Consumer Relationship Disclosure Form? at your first personal meeting with a real estate agent. is a seller's agent, a buyer's agent, or a facilitator. The form (see above) was revised in January 2017. It takes the place of another version of the form that had been in use for over ten years. Although the form appears daunting to some consumers at first glance, it is fairly straightforward upon closer inspection. Be sure to ask the real estate agent presenting the form to answer any questions you have about the form.